Canon has announced two new flash units called Canon Speedlite 320EX and Speedlite 270EX II. The Speedlite 270EX II is replacing the Canon Speedlite 270EX, which is their entry level flash. 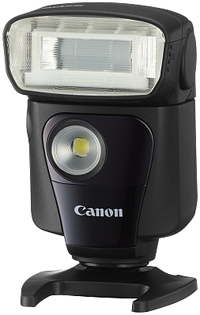 The Canon Speedlite 320EX is a mid level flash that is compact and have more control options. The Speedlite 320EX will be available in March 2011 and cost about £249.99, while the 270EX II will cost about £179.99 and released in March 2011. United Kingdom, Republic of Ireland, 7th February 2011 – Canon today announces the launch of the new Speedlite 320EX and Speedlite 270EX II – a duo of new additions to its leading EX Speedlite range. Designed for EOS Digital SLR (DSLR) owners who want to use creative lighting techniques to make their photography more engaging, each new model is ideal for experimenting with different lighting set-ups with off-camera support, allowing users to alter subject lighting and add ambiance to a scene. Ideal for users of the newly-launched EOS 600D and EOS 1100D DSLRs, the Speedlite 270EX II replaces the Speedlite 270EX at the entry level of Canon’s Speedlite range, whilst the Speedlite 320EX is a compact, powerful and versatile flash for users of mid-level cameras who want to take more control over lighting. Both new models are compatible with Canon’s distance-linked E-TTL II system, and can be used on-camera or as slave units controlled by a separate master unit or the Integrated Speedlite Transmitter of the EOS 600D, EOS 60D and EOS 7D. Ideal for more creative home studio shooting or general use, each model adds a new dimension to portraits or still life shots. Perfect for users who want a small, pocketable flash unit, the Speedlite 270EX II is a compact, high-power flash with a guide number of 27 (m/ISO 100) and fast, silent recycling between shots. Flash settings can be manually controlled through the camera menu system, and photographers can experiment with the manual bounce flash head for different effects, as well as the zoom head to ensure efficient light distribution across the scene. Providing the freedom for photographers to light a scene in a range of different ways, the Speedlite 270EX II launches with additional slave capability, allowing for creative, off-camera use. A new Remote Release function also wirelessly triggers the shutter release on a compatible EOS DSLR, allowing users to set up lighting without having to make repeat trips to the camera. Photographers can frame their shot, wirelessly trigger the two-second shutter release timer on the camera body, and then reposition the flash anywhere in the scene – capturing the image as the camera then fires both the flash and shutter release. Offering additional functionality, the new Speedlite 320EX is the ideal flash unit for amateurs and professionals looking for a secondary flash, featuring the ability to light a scene when recording movies. An LED flash offers a guide number of 32 (m/ISO 100), as well as the ability to change the flash coverage from 24mm to 50mm by manually extending or retracting the flash head. The flash head can also be rotated for more flexible bounce flash shooting, creating a wider variety of lighting effects. The Speedlite 320EX’s slave utility allows it to be controlled by a master unit via one of four selectable channels. Flash group A, B or C can also be selected, controlling the relative power of the flash and the resulting lighting effect. The Speedlite 320EX also features the Remote Release functionality allowing users to trigger their camera from the flash. The Speedlite 320EX is available from late March 2011, priced at £249.99/€299.00 RRP incl. VAT. The Speedlite 270EX II is available from late March 2011, priced at £179.99/€219.00 RRP incl. VAT.